OVER €1,000 IN subsistence expenses was claimed by two TDs each for a five-day trip to Switzerland last year as part of a special bonus expenses system, documents released to TheJournal.ie under the Freedom of Information Act show. Fianna Fáil TD and Leas Ceann Comhairle Pat ‘The Cope’ Gallagher, and Fine Gael TD Tom Neville each claimed subsistence expenses of €214 per day for the trip to Geneva in April - a total of more than €1,000 each for the five-day trip. Subsistence payments cover the cost of meals and drinks while TDs are abroad but do not include the cost of travel, hotel, taxis, telephone calls or car parking which are already covered under separate TD expenses. A small number of additional expenses, for taxis, were made as part of ‘miscellaneous’ claims. This brought the total expenses claimed by Gallagher for the Geneva trip to €1,200 while Neville claimed €1,220 in total. Gallagher, from Donegal, and Limerick TD Neville were in Geneva last year with three other TDs from 24 April to 29 April for the 138th Inter-Parliamentary Union Assembly where parliamentarians from governments around the globe gather to address international issues. With the majority of costs already covered under separate expense claims, neither TD could say whether the €214 was spent on food and drink in Geneva. Both responded to queries saying that the over €1,000 in top-up expenses claimed for the trip was within the allowed expense repayment guidelines, however. Fine Gael’s Neville responded to queries saying that he was sent as an Oireachtas Representative to the assembly and submitted his claim through the official process “as advised which was validated”. “Any trips that I’m on…whatever I claim is in conformity with the guidelines,” Gallagher told TheJournal.ie. You claim whatever the entitlements are according to the Department of Public Expenditure and Reform’s guidelines. That’s it. Gallagher, who described the practice as “the norm”, said that the amount claimed back in subsistence expenses was likely due to the Swiss city’s expensive prices. Repayment rates for government employees claiming expenses vary between cities around the world. 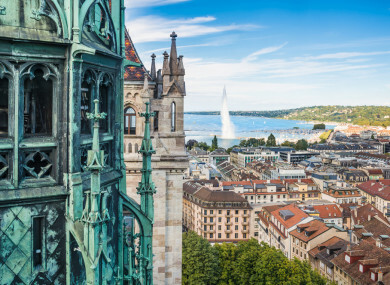 Geneva was ranked the sixth most expensive city in the world by the Economist Intelligence Unit last year. Gallagher and Neville were accompanied by three other TDs on the trip. Their expense claims were not immediately available. In 2016, RTÉ reported that the Department of Public Expenditure and Reform had ignored requests to reform the special bonus expenses system after the Comptroller and Auditor General raised concerns about it. A spokesperson for the Department of Public Expenditure and Reform told TheJournal.ie that there are currently no plans to review subsistence payments and that any changes would need to “take place following consultation with the Houses of the Oireachtas Commission”. Enid O’Dowd, a chartered accountant who runs the CAVA (Chartered Accountants Voluntary Advice) clinic in the Rathmines Citizens Information Centre, is an outspoken critic of the current expenses regime for TDs and Senators. O’Dowd says that “you have to remember that our politicians make the rules regarding their own salaries and expenses”. “This issue has come up before and now our politicians make the rules regarding their own salaries and expenses. To use the old cliché, turkeys wouldn’t vote for Christmas. Email “TDs claim €1,000 in subsistence payments for five-day Swiss trip”. Feedback on “TDs claim €1,000 in subsistence payments for five-day Swiss trip”.